If you were intrigued by last year's HUGO, Martin Scorcese's love letter to silent film pioneer George Melies, now is your chance to see Melies' best known film, A TRIP TO THE MOON, on the big screen. Also on the bill is THE EXTRAORDINARY VOYAGE, a documentary that covers Melies life and career, as well as the painstaking restoration of the hand colored version of TRIP, long thought lost, that is showing on this program. Made in 1902, A TRIP TO THE MOON is one of the cornerstones not just of science fiction film, but of modern filmmaking, period. Some may say it looks hokey by today's standards, but the intentionally unreal appearance of the sets, costumes, and special effects gives the film an aura of pure fantasy that few modern films come close to approaching. Even if you prefer your special effects to work towards creating a sense of realism and believability, you have to consider the technology of the times. Movies had only been in existence for a few years, and Melies was the James Cameron of his time. Even more than that, since he had his hand in almost every aspect of the film, including production, direction, editing, special effects, set design, and acting. The plot is pretty thin, and really little more than an excuse for Melies to show off his special effects trickery, but then you could say the same about a lot of modern Hollywood blockbusters. The difference is, the newer films don't have the same sense of fun and showmanship about them. Lightweight though it may be, A TRIP TO THE MOON is both important from a historical perspective, and more importantly, just plain fun to watch. And at only fifteen minutes in length, it's considerably less bloated than AVATAR or a TRANSFORMERS sequel.A new electronic soundtrack by French rock band Air makes it fun to listen to, as well. The aproximately hour long companion documentary enhances one's enjoyment of TRIP by putting the film in its proper context and detailing the amazing restoration process that has allowed this particular version of the film to exist in the world once again. 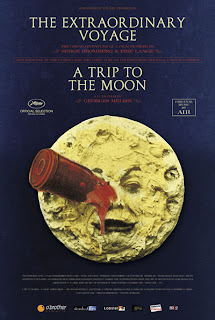 4 out of 4 stars for A TRIP TO THE MOON, 3 1/2 out of 4 stars for THE EXTRAORDINARY VOYAGE.